For the character, see Frog (character). For the card part, see "Froggie". "D.3.S. Frog", three "Treeborn Frogs" and three "Des Frogs" all in the artwork of "D.3.S. Frog"
"Frog" (ガエル Gaeru) is an archetype of WATER Aqua monsters that debuted in Cybernetic Revolution. This was both the first WATER archetype and the first Aqua archetype. The archetype is used by Princess Rose in the Yu-Gi-Oh! GX anime. The "Toad" series is a related series of monsters that support the "Frog" archetype. True to their their name, the general design of "Frog" as well as the related "Toad" monsters resemble their real-life counterparts. Some "Frog" monsters like "Flip Flop Frog" and "Poison Draw Frog" showcase their long, sticky tongues in their artwork. Most of the "Frog" and Toad monsters have distinctive colorful markings on their bodies and heads, most notably "Swap Frog", "Dupe Frog", "Beelze Frog", and "Ronintoadin". Some "Frog" and Toad monsters resemble angels like "Treeborn Frog, while others resemble demons like "Beelze Frog" and "Swap Frog". This thematic resemblance to angels and demons is further highlighted by the contrasting half-angel, half-demon appearances of "Substitoad" and "Tradetoad". The Japanese name of the "Frog", Gaeru archetype derives from a voiced form of the word for "frog", Kaeru, which in turn is used for the names of "Toad" monsters. In most of the TCG, Gaeru is translated to words for "frog", while Kaeru to words for "toad" to avoid ambiguity. In the Portuguese version, however, the reverse is true: "Frog" is translated as "Sapo" (which in fact means toad), while "Toad" is called "Rã" (frog). In the Japanese version, members of both the "Frog" archetype and the "Toad" series have their name be puns based on Gaeru/Kaeru and various expressions, chiefly verbs, that happen to have gaeru/kaeru as part of them. D.3.S. Frog Gaeru Sandesu Frog Three-Death "I'm Mr. Frog"
Des Frog Desugaeru Death Frog "to come across"
Centerfrog Negaeru Sleeping Frog "to switch sides or to betray"
Dupe Frog Machigaeru Evil Wisdom Frog "to make a mistake"
Flip Flop Frog Uragaeru Reverse Frog "to be turned inside-out"
Submarine Frog Michigaeru Unknown Frog "to be hardly recognized"
Swap Frog Onigaeru Ogre Frog "to change clothes"
Treeborn Frog Yomigaeru Underworld Frog "to be revived"
Unifrog Kangaeru Penetrating Frog "to think about"
Though with weak stats, "Frog" monsters are very versatile and their effects include rapid Summoning, the option to increase their ATK or protect themselves from destruction, and wiping out all cards the opponent controls, with "Des Croaking". Many "Frog" cards have low Levels, which lets them benefit from cards like "Gravity Bind", "Wetlands", "Pride of the Weak" and "Graceful Revival". One card that kept "Frogs" versatile and powerful was "Substitoad", but after Frog FTK won the 2010 World Championships, it was Forbidden, so many "Frog" Decks lost their supreme speed. Before "Monarch" monsters gained support through recent years, they were commonly combined with monsters like "Treeborn Frog", "Swap Frog" and "Ronintoadin", that could provide fodders for the Tribute Summons. This granted them popularity and competitive viability and the Deck became known as Frog Monarch. Another popular combination is "Sea Lancer". It can equip itself with as many banished Aqua, Fish and Sea Serpent monsters as possible, which raises is ATK by 1000 and those targets can be easily provided by "Ronintoadin". It can send an equipped monster to the Graveyard to prevent its destruction and by sending a "Dupe Frog" or "Poison Draw Frog", it is possible to prevent a loss in card advantage, by drawing a card or search/retrieve a "Frog" monster. 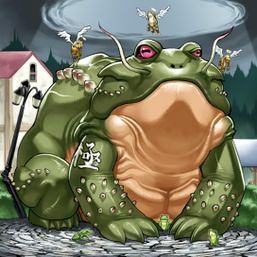 In 2016, with the Invasion: Vengeance Booster Pack, the archetype gained its boss monster, "Toadally Awesome", a very solid Xyz that is able to negate the activation of cards and effects, steal the negated card, Special Summon a "Frog" monster from the Deck and retrieve a WATER monster when it is sent to the Graveyard. Combined with the "Paleozoic" Trap Cards, that can Summon themselves from the Graveyard as Level 2 Aqua monsters, the Deck rapidily gained popularity and competitive relevance, which later resulted in "Toadally Awesome" becoming Limited in the OCG. Cards such as "Zombie World" can be used to prevent "Toadally Awesome" from being Summoned. Card effects that banish cards that would be sent to the Graveyard, such as "Masked HERO Dark Law" and "Dimensional Fissure", greatly hamper the strategies of "Frog" Decks..
"Froggy Forcefield" is not a "Frog" card, because it does not have 「ガエル」 in its Japanese name. "Slime Toad", previously known as "Frog the Jam", is also not a "Frog" card because of its Japanese name, and was renamed to clarify this. Until that erratum, all cards that mentioned a "Frog" monster had the sentence "except 'Frog the Jam'", which made that monster become a meme among players. This page was last edited on 18 January 2019, at 17:42.